If you want to get real deep with the Meatwave, I'd tell you it all started with ham at the age of four. It was at that fateful time that my parents decided to start keeping kosher and deprive me of my favorite food of all time—ham! I vowed once leaving home, I would never again bound myself to a diet based on religion, mainly because I wanted to eat pork to my heart's content, but also because it was hard to reconcile what was supposed to be positive force in life being one that kept me from achieving a more pure happiness. 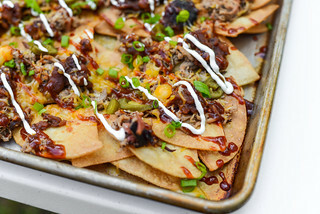 So it went, once going to college I shunned kashrut and when I got into cooking, you could say my draw to all things smoked hog could have been linked to both an exercise in freedom and making up for lost time. While this blog has been more of a forum for slow smoked ribs, pork shoulders, and the like, sweet city ham will always be my first porcine love, and this orange-honey glazed ham is a representation of that adoration. City ham is a fickle beast—on one hand it almost always comes fully cooked, so it should be easy peasy to prepare right, but if not gently brought up to just the right temperature, it can quickly become dry, robbing it of its full potential. 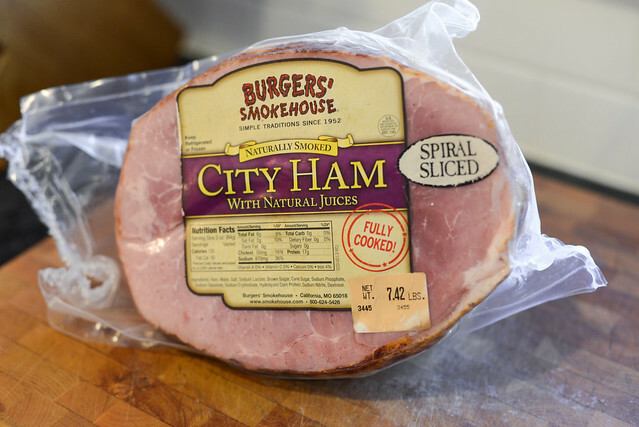 Starting out with a quality product is the first step to success, and I've become quite fond of the hams outputted by Burger's Smokehouse, which have always been super moist with a more intense, sweet hammy flavor than other brands I've used in the past. The extreme sugary sweetness of the glaze has been part of the draw for me as well, and when using less quality products, also helped improve the overall flavor. But since the meat from a Burger's ham is so good in its own right, I wanted to try to make a glaze that would do more in adding a final complexity to the flavor than merely creating a sugary shell. 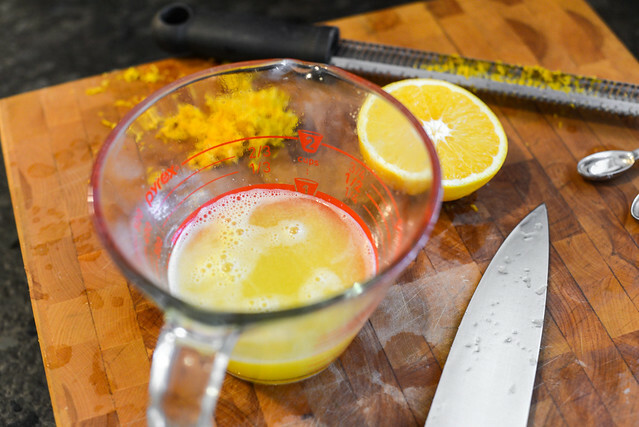 I started the recipe out with freshly squeezed orange juice that was simmered with honey, whole grain mustard, and orange zest until thick and syrupy. Upon first taste, it was good, but I felt it was lacking at least a little of the normal sugary quality and some savoriness, so added in light brown sugar and soy sauce to make up for those failings. Now it was sweet, but not sickeningly so (as a lot of glazes normally are), with the orange and mustard really giving the sauce a profile I have not tasted on a city ham previously. With the glaze in order, I ventured forth in an attempt to heat this ham perfectly. I have admittedly only achieved what I consider perfection once before, and it was when I followed the directions laid out in recipe I found in Cook's Illustrated. Their method takes every precaution to slowly bring the ham up to temperature without drying it out. 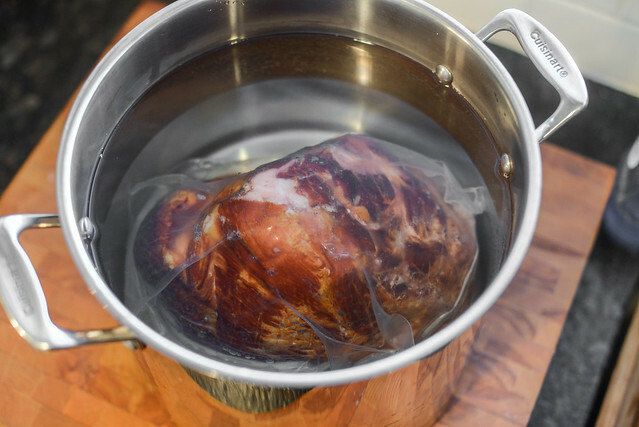 The first step was to remove the chill from the ham by soaking it in hot tap water, with the ham still in its original packaging, for an hour and a half, changing the water halfway through. Next was the use of an oven bag during the cook. I honestly had never heard of these things before this recipe, but there they were at the grocery, next to the plastic storage bags, wraps, and foils, where I guess these high temperature resistant bags have sat for many, many years without me ever noticing. 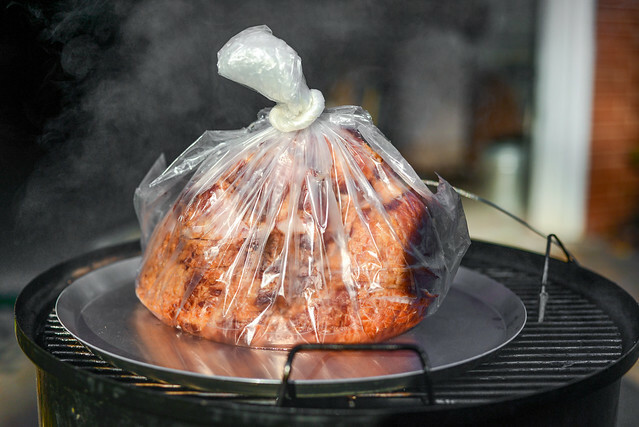 The bag here will create a moist environment for the ham to roast in and speeds up the cook, adding protection against drying out. The last piece of the equation is a low heat, and what delivers a low heat better than a smoker (well, an oven, but that was filled with a turkey when I cooked this ham over Thanksgiving). 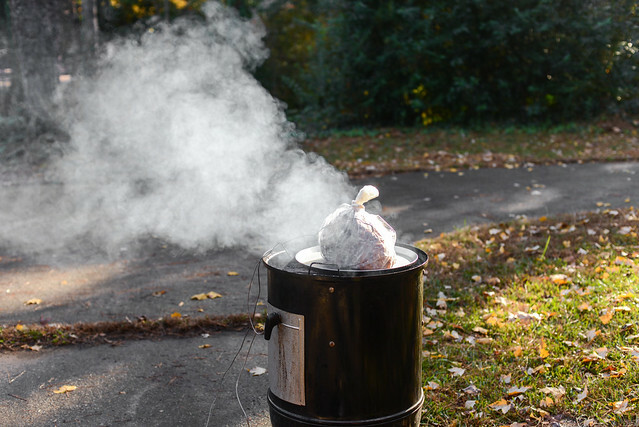 Since the ham is already cooked, it won't absorb any additional smoke, so there's no real advantage to using the smoker here except it can hold a steady 225-250°F temperature and allows for cooking outside if space in the oven is otherwise unavailable. 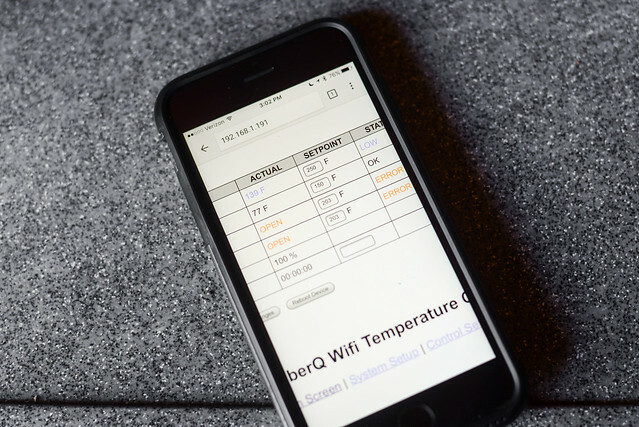 I employed my handy BBQ Guru Cyber Q to keep my smoker running low and slow and also allow me to keep a close eye on the internal temperature, making sure I moved on the next step once the meat hit 100°F. This happened rather quickly for me, as my extra hot tap water had risen the temperature to almost 80°F already, but it would normally take one to one and half hours under normal conditions. Once the meat hit the set temperature, I removed the oven bag, brushed on the glaze, covered, and let the ham cook another 15 minutes. Then I repeated the glaze application and continued cooking until the meat temp rose to 120°F. Then all that was left to for me do was remove the ham, let it rest for 15 minutes, and slice and serve. 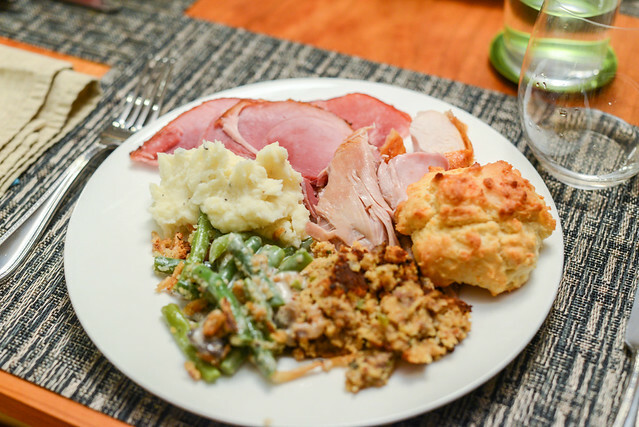 And here was my holiday plate, filled to brim with delectable delights, but none were quite as good as that ham, in my opinion. The meat was moist and sweet, with an deep and excellent porcine flavor. The glaze was not the sugar coating I was used to, but instead added a complexity of citrus and honey flavor to the edge, with the mustard seeds adding little pockets of pungency that really shook things up from the norm. 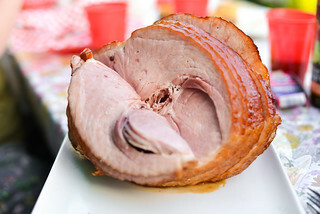 It was a grand success in every respect, and made the holiday all the more joyous for me, standing as an affirmation that pork equates to personal happiness, which in turn, fuels the Meatwave. A sweet city ham is heated slowly in a smoker, resulting in moist and delicious meat that's paired with a orange-honey glaze, adding a unexpected complexity to the end result. 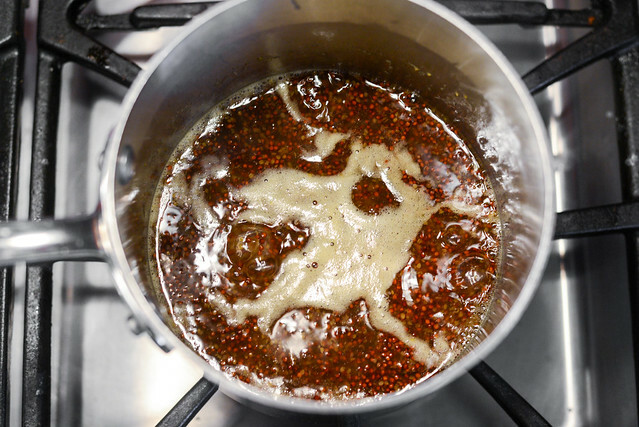 To make the glaze: Whisk together orange juice, honey, mustard, brown sugar, orange zest, and soy sauce in a small saucepan. Bring to a boil over medium-high heat, reduce to a simmer, and cook, stirring occasionally, until thickened to a syrupy consistency, 20 to 30 minutes. Remove from heat and set aside. Place ham, in original plastic packaging, in a large container and cover with hot tap water. Let sit for 45 minutes. Drain water, recover with hot tap water, and let sit for an additional 45 minutes. Drain water and remove ham from packaging. 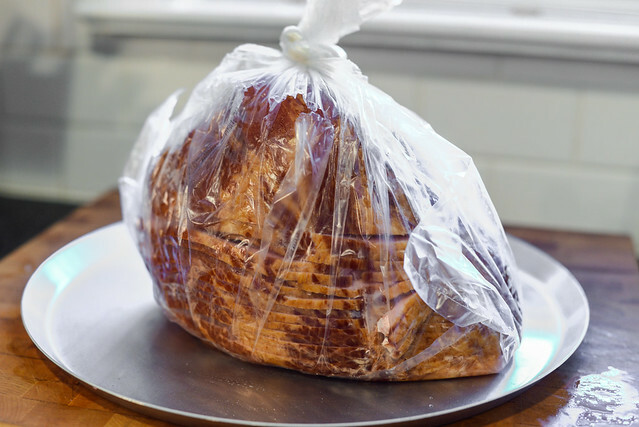 Place ham in an oven bag and tie close with bag fitting snugly around ham. Trim excess plastic from top of bag and cut 4 slits in bag around the top of ham with a paring knife. Place ham on a baking sheet, cut side down. Fire up smoker or grill to 225°F. 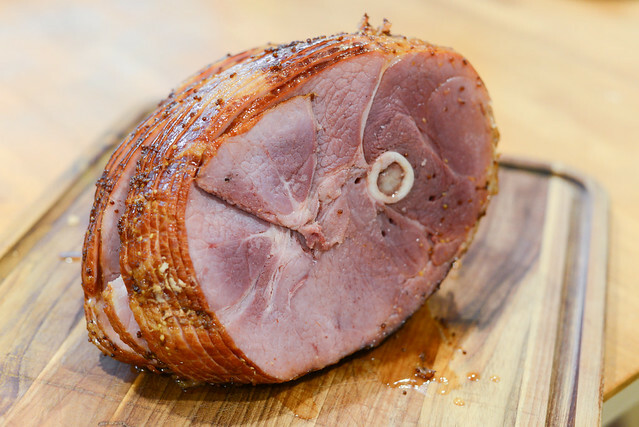 Place ham in smoker, cover, and cook until an instant read thermometer registers 100°F when inserted into thickest part of ham,1 to 1 1/2 hours. 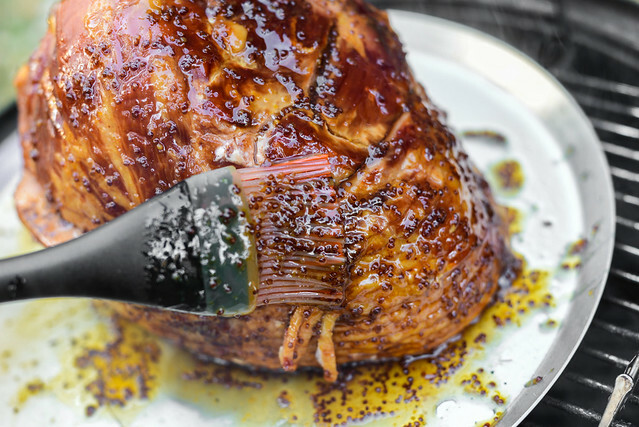 Unwrap ham and brush liberally with glaze. Cover and continue to cook for 15 minutes. 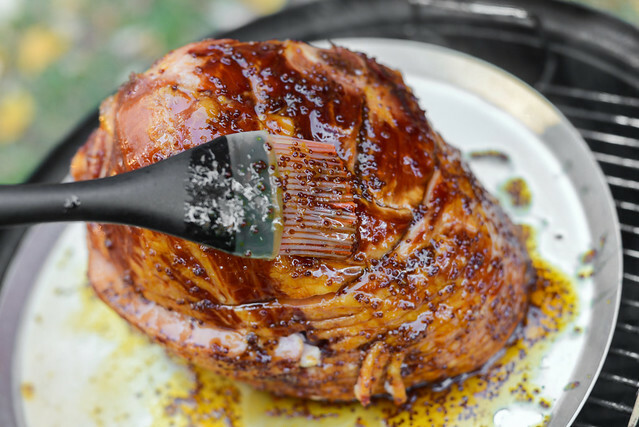 Brush ham with glaze a second time, cover, and continue to cook until an instant read thermometer registers 120°F when inserted into thickest portion of ham, about 15 minutes more. Remove ham from smoker, let rest for 15 minutes, then serve. 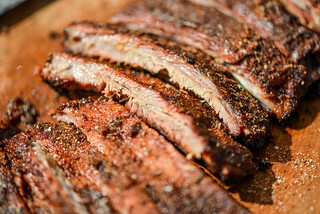 I would like to personally congratulate you as your blog The Meatwave has been selected by our panelist as one of the Top 50 Meat Blogs on the web. I personally give you a high-five and want to thank you for your contribution to this world. This is the most comprehensive list of Top 50 Meat Blogs on the internet and I%u2019m honored to have you as part of this! A lot of device users makes use of the internet.